The team behind Tigi's Ethiopian Restaurant has one simple goal: the make fresh, delicious food that they themselves would want to eat every day. Anyone can enjoy the food here, including vegetarians, vegans, gluten-free diners and others. Tigi's boasts an entirely separate vegan menu without any animal products, and it's nearly as large as the main menu. Go meat-free with a dish like the Misir Wot, split lentils stewed with berbere, garlic, and a blend of spices, or the Shiro Wot, featuring ground chickpeas also seared with berbere and a signature mix of seasonings. Meat dishes include beef, lamb, and chicken entrees. 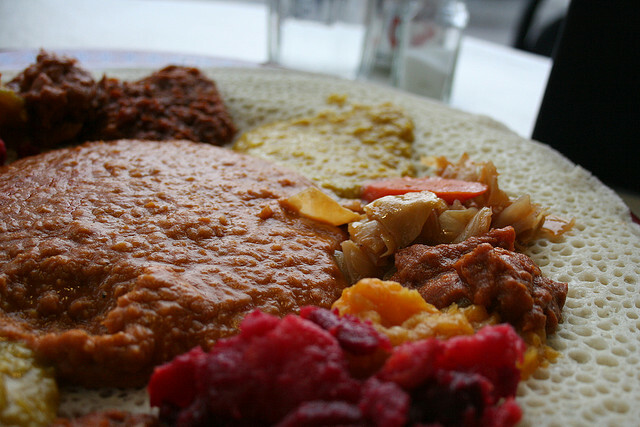 Pair the Yebeg Tibs—cubed lamb with veggies, herbs, and spices—with some of the gluten-free injera for a filling, authentic meal at Tigi's Ethiopian Restaurant.